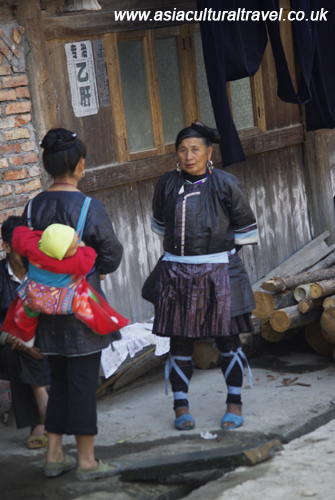 The birth of a child is a momentous occasion in a Dong village and requires strict adherence to many conventions. The first is the “stepping-over-the-threshold” convention, which is the belief that the first person to enter the house where the child was born will be the greatest influence on its personality and future success. After this person is established, neighbours are invited to the house to bring gifts. The birth is then announced to the mother’s family and, on the third day, female relatives will visit with more gifts. 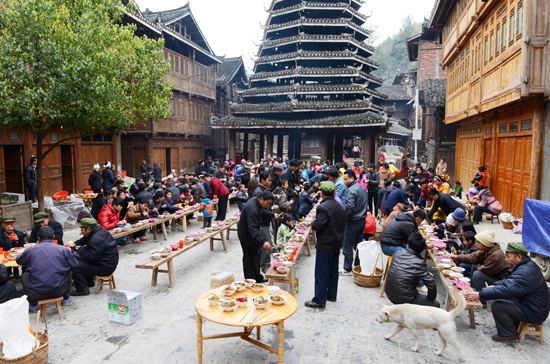 After the visitations from friends and relatives, a ceremony called “building the bridge” is practised, where three wooden planks are lined up side by side to symbolise a bridge and express goodwill to people passing by the house. The child’s hands are then wrapped in cloth, which the Dong believe will influence the child not to steal things later in life. The child’s first haircut and first taste of fermented rice happens when they are about one month old, and it is considered unlucky if these events happen prior to the one month mark. At six months old, the child will have their first taste of meat dipped in wine, which is considered a major milestone in the child’s life.